Amy Kazymerchyk (left), Chandra Melting Tallow, Jeneen Frei Njootli, Gabrielle L’Hirondelle Hill and Tania Willard’s film Coney Island Baby runs to November 3 at Gallery TPW. Photo Courtesy of Amy Kazymerchyk and Aaron Leon. One reason art is good for you: generally, you need to walk around to see it. Do it with a friend, adding conversation to the mix, and you have a program for healthy cogitation. This fall, the ambitious art lover can get a lot of walking done. Toronto’s arts organizations have a slew of events and exhibitions planned. Some of these take place outdoors as temporary installations. Others are launching new art venues, kicking off fresh prospects for the city’s scene. Below is a list of upcoming events to get excited about – and plan a day’s outing or two. Part of an ongoing series of art commissions for the Don Valley Park, Kwan wrote a text piece that has been writ large on a retaining wall of the Don River. A five-year-long installation, the work reflects on the way public space is defined by the imperfect coexistence of its members. Munro presents collage works that use photos of the dwellings occupied by Belgian surrealist René Magritte (a Canadian, Munro lives in Belgium). Complementing this is an installation by Toronto’s Smit, evoking the armature of home decor. This show is about a 1961 Life Magazine exposé that changed the life of a 12-year-old boy from a Rio de Janeiro favela. African-American Parks was a pioneer of photojournalism. He went on to direct Hollywood films, including Shaft. Mexican artist Romero developed this sculptural installation at the AGYU after a number of visits to Toronto. It’s result of a series of workshops she did with the Mississaugas of the New Credit First Nation, along with research into Canadian mining practices abroad. 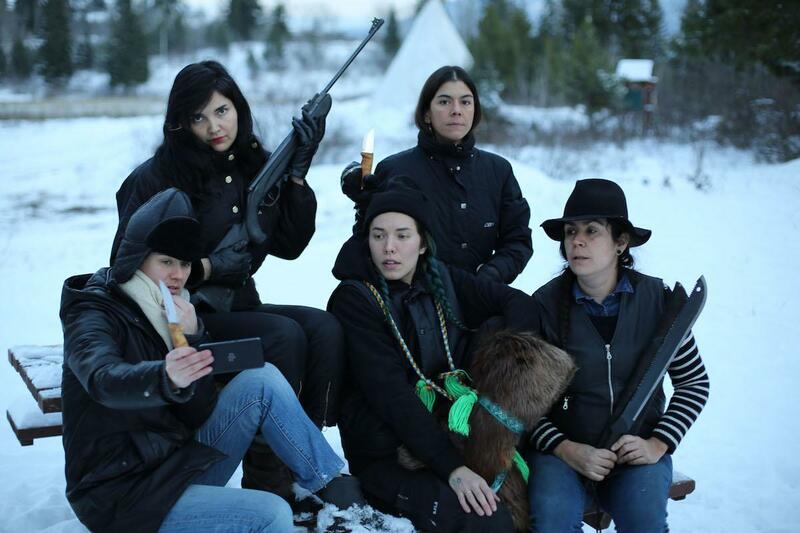 Shot on the territory of the Secwépemc Nation in B.C.’s interior, Coney Island Baby is a collectively authored film, made by four women. Focusing on skills that are often the responsibility of women in Indigenous communities, like the snaring of rabbits, the show also features sculptural installations by two of the artists. A show about “redaction” suggests the long history of political censorship; as an artistic method, however, redaction is essentially collage. As the works in this group show demonstrate, the technique provides endless scope for artists to cut and recombine materials – to bracing effect. Includes Lise Beaudry, Nadia Myre, and Michèle Pearson Clarke. The title says it all. With its move to a new location in the Lower Junction, Toronto’s MOCA is announcing the scale of its ambitions. Its inaugural exhibition, Believe, features celebrated artists like Barbara Kruger, Rajni Perera, Ange Loft and Jeremy Shaw, among others. Occupying five stories in a former aluminum factory, the show is free all weekend. This year, Toronto’s all-night art event includes Scarborough as a location. All projects on view in STYLL – including performances, soundscapes and projections – were made by Scarborough-based artists, or are the result of collaborations between artists and community members or groups. Artists include Hiba Abdallah (also included in the MOCA show), Reaching Intelligent Souls Everywhere (RISE), Ekow Nimako and Director X. The Bentway presents the Canadian debut of this monumental light work by the acclaimed Dutch artist. Made from LEDs and special projection lenses, it’s part of a series of art-based installations called If, But, What If? running through November under the Gardiner. A range of public programs will accompany it. These two solo shows help celebrate the gallery’s 25th anniversary. Morton is known for her knitted works, sometimes at building scale; Shayuk makes fine abstract paintings that often incorporate sculptural elements. You are currently browsing entries tagged with The Bentway at Army of YouTube.